The federal lawsuit filed on behalf of Stephon Clark's two sons, his parents and his grandparents contends that officers used excessive force and that he was a victim of racial profiling. The family of an unarmed black man shot by police in Sacramento, California, is seeking millions of dollars in damages from the city for his death. The city announced the claims Thursday. The family of 22-year-old Stephon Clark is seeking more than $15 million, including for funeral expenses, attorney fees and punitive damages. The city says such claims are usually a precursor to a lawsuit. SACRAMENTO, Calif. (AP) — A doctor hired by the family of an unarmed black man shot by California police defended his autopsy on Wednesday, a day after the coroner's office reported different findings. 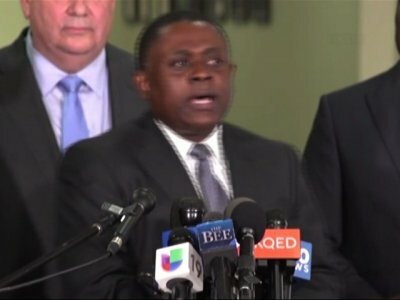 Dr. Bennet Omalu said in a statement that he stands "firmly in defense" of his examination of 22-year-old Stephon Clark. The official autopsy released Tuesday by Sacramento police said Clark was shot seven times, not the eight that Omalu said he found. SACRAMENTO, Calif. (AP) — California prosecutors on Monday charged the brother of an unarmed black man who was recently shot to death by Sacramento police with misdemeanor assault and vandalism. SACRAMENTO, Calif. (AP) — Police on Thursday arrested the brother of Stephon Clark, an unarmed black man who was shot and killed by Sacramento officers last month, on suspicion of felony assault and vandalism, authorities said Thursday. Stevante Clark, 25, also is accused of making criminal threats and abusing a 911 emergency line. Police did not provide further details, citing an ongoing investigation. Authorities say the brother of Stephon Clark, an unarmed black man who was shot and killed by Sacramento police, has been arrested on suspicion of felony assault, felony vandalism, criminal threats and abusing a 911 emergency line. SACRAMENTO, Calif. (AP) — It may be more than a year before a Northern California prosecutor decides if two police officers broke the law when they fatally shot a black man who was later found to be unarmed, she said Wednesday. Sacramento Police Chief Daniel Hahn says more video of last month's shooting of an unarmed black man will be released within a week. The department released video of Stephon Clark's shooting within three days, including body camera footage from the two officers who shot him and from a sheriff's department helicopter circling overhead. SACRAMENTO, Calif. (AP) — Sacramento has agreed to reform its policing practices and pay a black man $550,000 after an officer threw him to the ground over a jaywalking allegation last year and repeatedly punched him in the face, his lawyers said Friday. “You can’t really be a cowboy in law enforcement anymore,” said Rochester Police Lt. Frank Ohm. Thankfully, he’s right. In today’s world of smartphone cams and social media, when a police officer mistreats someone, we generally hear about it. News of injustice travels fast, and the public is increasingly intolerant of abuses of power, as in cases such as the shooting of Stephon Clark in Sacramento, Calif., last week. SACRAMENTO, Calif. (AP) — California's first black U.S. senator said Thursday that better training is needed to help police officers recognize biases in response to last month's shooting of Stephon Clark, a 22-year-old unarmed black man shot by Sacramento police. SACRAMENTO, Calif. (AP) — Sacramento Police Chief Daniel Hahn had his first major encounter with officers as a kid who witnessed a murder in a tough part of California's capital city. SACRAMENTO, Calif. (AP) — Video shown Monday that was taken by a dashboard camera inside a sheriff's vehicle shows it hitting a protester and driving away — the latest flashpoint following the fatal police shooting of an unarmed black man in Sacramento. The law enforcement official behind the wheel likely didn't know he hit someone, Sheriff Scott Jones said at a news conference where the video was shown, noting that he hasn't spoken to the driver, whose name has not been released. WASHINGTON (AP) — The Supreme Court took sides in a police shooting case Monday, ruling that an Arizona police officer who shot a knife-wielding woman four times was immune from being sued. But Justice Sonia Sotomayor wrote in a dissent that the court's decision "sends an alarming signal to law enforcement officers and the public." A bystander video shows the moment a demonstrator was hit by a Sacramento County Sheriff's deputy's vehicle Saturday night as people protested the shooting death of Stephon Clark. The collision happened during a vigil as a woman carrying a "Stephon Clark Rest in Power" sign walked in front of a sheriff's vehicle and motioned the driver to stop, according to a video from the National Lawyers Guild Legal Observers obtained by CNN. SACRAMENTO, Calif. (AP) — Golden State Warriors coach Steve Kerr found himself on the defensive for not attending a rally in California's capital city after he pledged his organization's support to the family of an unarmed black man killed by police. SACRAMENTO, Calif. (AP) — The family of Stephon Clark joined hundreds at a rally Saturday, urging California's capital city not to let his memory or calls for police reform fade nearly two weeks after the 22-year-old unarmed black man was killed by Sacramento officers. This week's images include the brother of police shooting victim Stephon Clark confronting the mayor of Sacramento, Calif.; tear gas canisters falling on Palestinian protesters at the Gaza Strip-Israel border; and Christian Holy Week rituals from around the world. SACRAMENTO, Calif. (AP) — Sacramento police shot Stephon Clark seven times from behind, according to autopsy results released Friday by a pathologist hired by Clark's family, a finding that calls into question the department's assertion the 22-year-old black man was facing officers and moving toward them when he was killed. About 200 protesters have gathered in Sacramento to condemn the police shooting of an unarmed black man. Demonstrators gathered Friday night at City Hall, chanting the names of black men who have died in police shootings around the country. SACRAMENTO, Calif. (AP) — The struggling Sacramento Kings find themselves in the national spotlight and it has nothing to do with another disappointing NBA season in their sparkling new 2-year-old arena. Instead of looking ahead to the draft lottery as they wind down their 12th consecutive losing season, the Kings — like many nationwide — have turned their attention to demonstrators who have joined hand-in-hand on game nights to block entrances to the building. Sacramento Kings player Garrett Temple is telling a community gathering of several hundred black Sacramento residents that Stephon Clark "could have been any of us." Temple joined teammate Vice Carter and former Kings player Doug Christie Friday at a South Sacramento church for an event to support black youth in California's capital city. Video from Sacramento police officers' body cameras and a Sheriff's Department helicopter circling overhead show Clark's final moments but don't definitively answer the many questions that have arisen since the March 18 shooting.